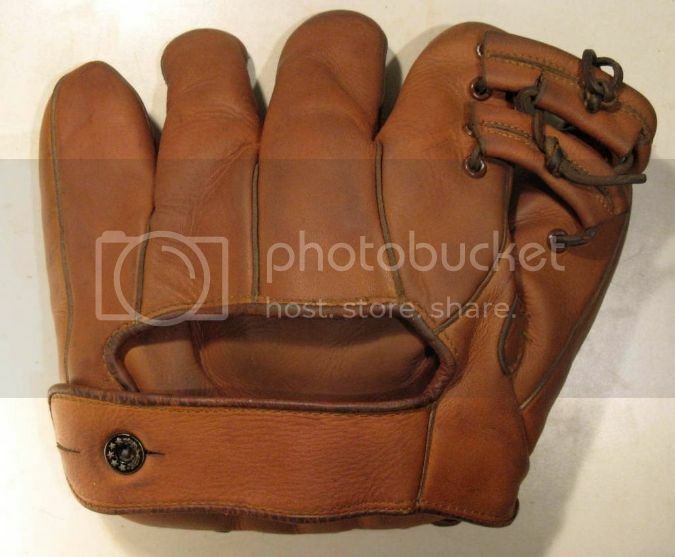 I recently picked up this J.C. Higgins "Bucky Walters" model glove. I think it is from the late 1930's-40's. I like the double finger lacing and the one piece face, kind of an unusual combination. 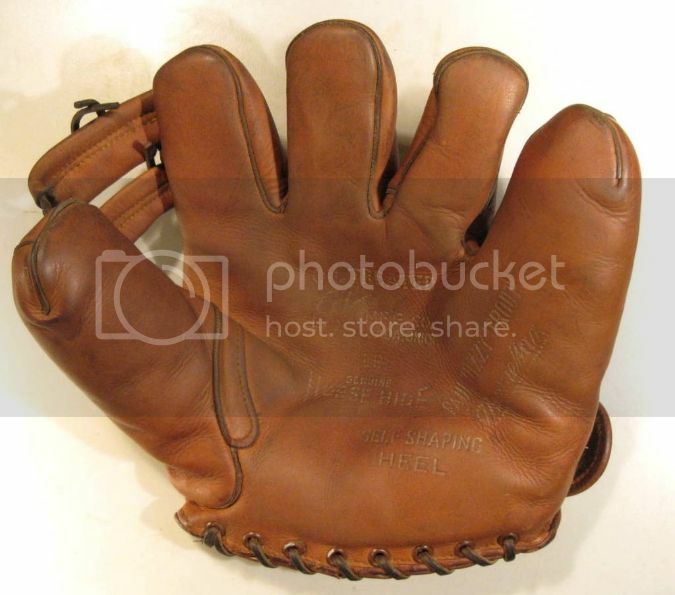 It's a really large glove typical of the 40's and buttery soft leather. 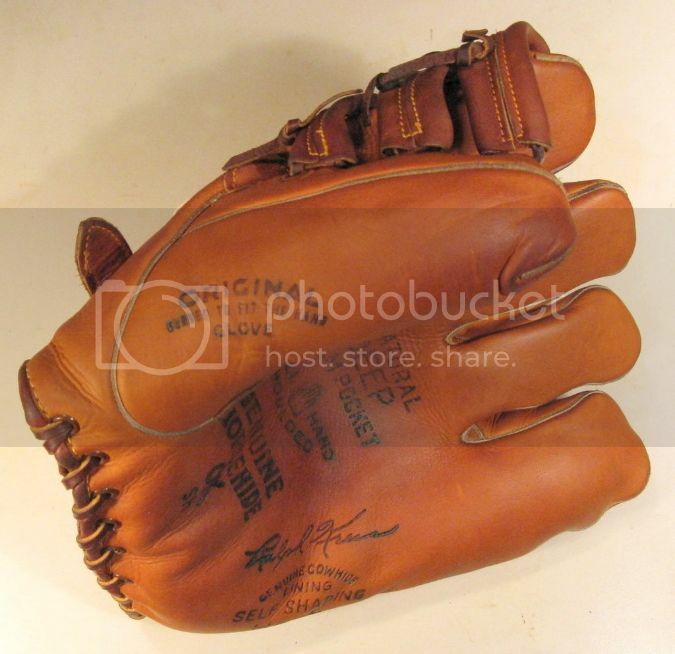 I wonder if George Reach Co. made gloves for Higgins in that time frame. The glove has some similarities to other Geo. Reach models I have. Was excited to see this unique 2 Finger OK MFG model pop up on ebay last week. It's pretty cool with a web not seen very often. It's been a really fun summer around these parts! 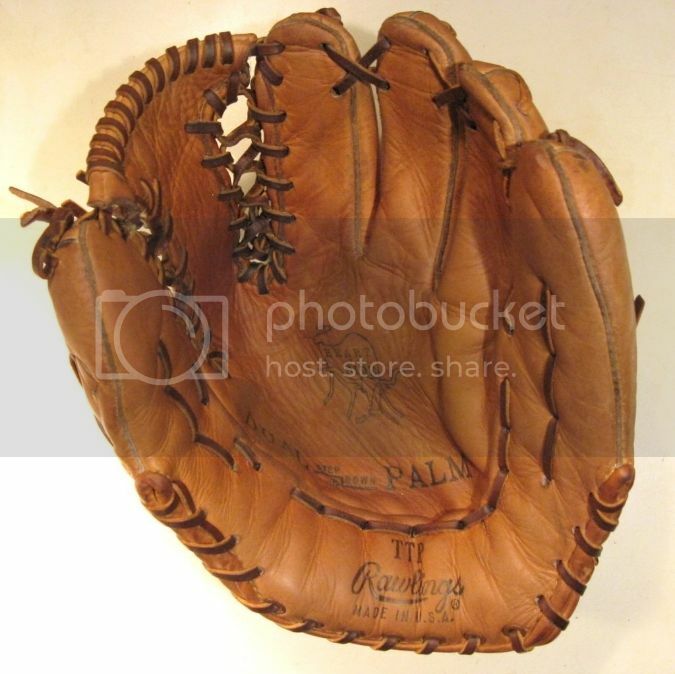 Some really nice gloves/mitts and bats. Have fun at the National! Richie, you dog! What an incredible haul. So jealous that you guys can actually find stuff. Love it! Never had a summer season like this before. I decided in the spring to start talking to the dealers more at the local flea markets. If they were selling a box of 1989 Topps baseball cards I asked if they had any old equipment. It started to pay off! I found if you pay up a couple times they start hunting for you. I haven't had many OK Mfg. gloves so I keep my fingers crossed with ones I am not familiar with and this one turned out to be a real beauty. It's a 1940s OK Mfg. "Paul 'Dizzy' Trout" model. It's big, beefy and top quality. Great glove Mike - love that model! As I was researching this one, I noticed you had a couple model LR with different endorsers. I figured you must think highly of them. Just got around to photographing this one. It's a Rawlings "Dual Step Down Palm" model TTP circa 1963. I had been looking for a nice "DSDP" model for a long time. 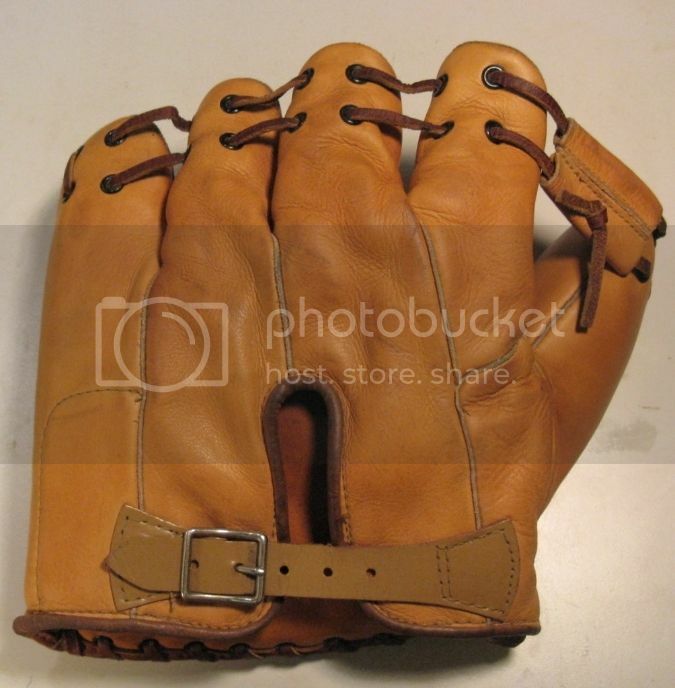 They are very popular among the modern glove collectors. I like this six finger version. The most notable improvement from earlier models is the patented "Big T" web. This was the design going forward from 1963. 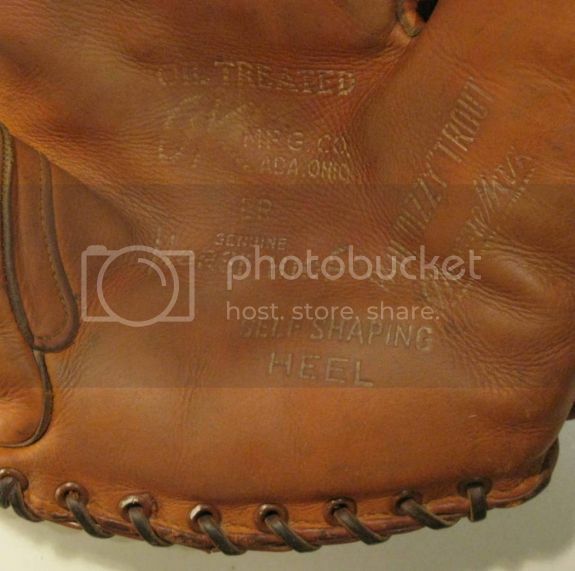 Rawlings first issued the "DSDP" model in 1962 and it had the original "Trapeze" web. That was model TGP. It was made for one year only. Mark Walters is a long time Rawlings collector. He has the model TGP. One thing about Mark's collection, he doesn't have any old example, it's usually the rarest version. I recently picked up this 1940's OK Mfg. 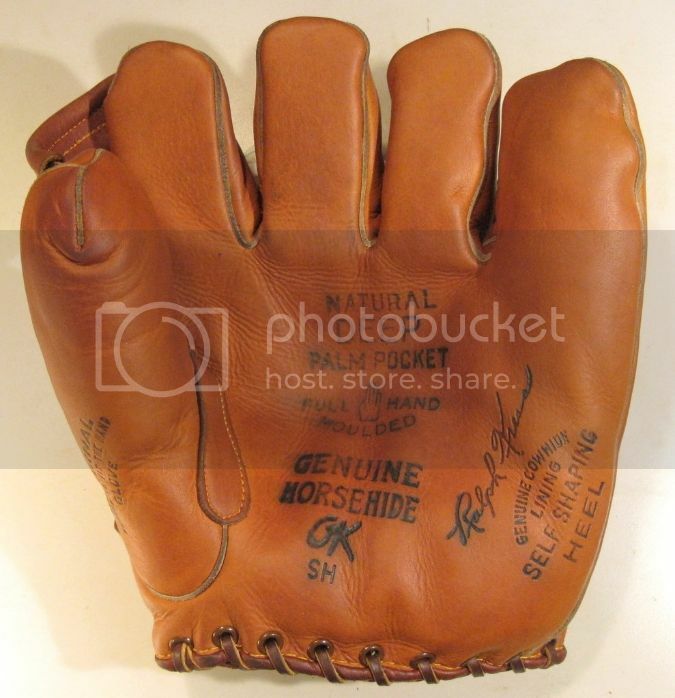 "Ralph Kress" glove. It is rare to find a buckle back model with the triple tunnel web. 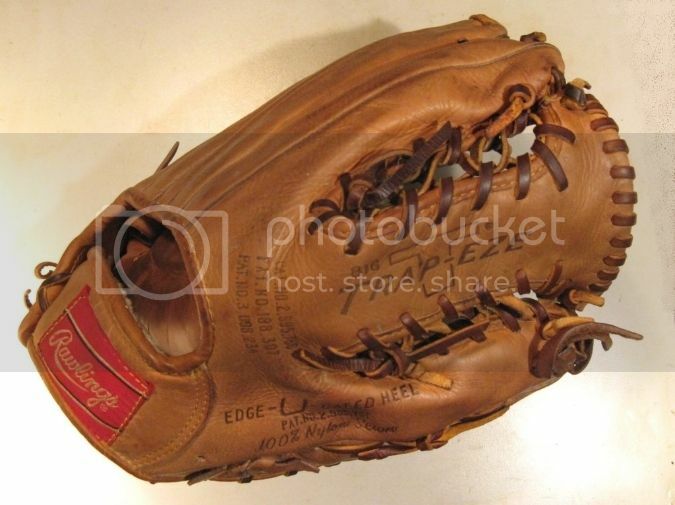 Plus, It's a quality glove in great shape. The box price tag is from "Emroe Sporting Goods, Indianapolis, Ind." 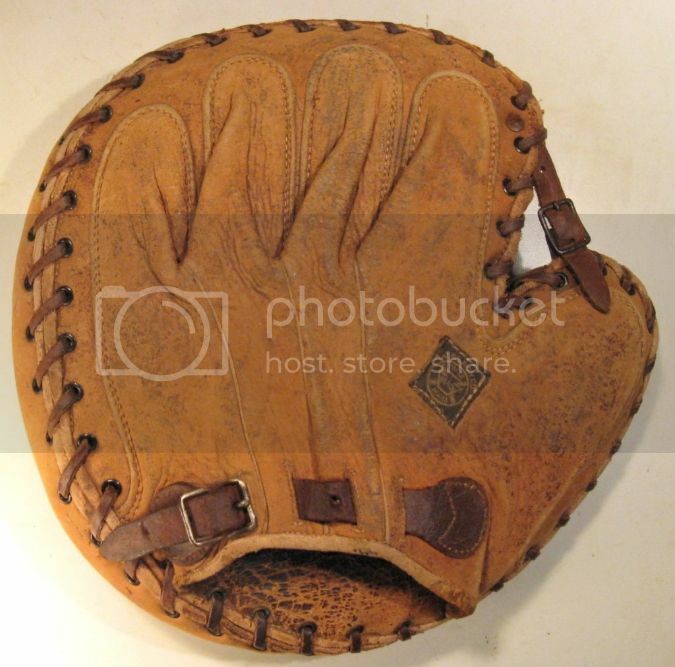 I recently obtained this mitt and just finished cleaning it up today. It's an Olympan M27 Frank Hayes model. I'm not sure about the year, but it's probably from the late 1930s. 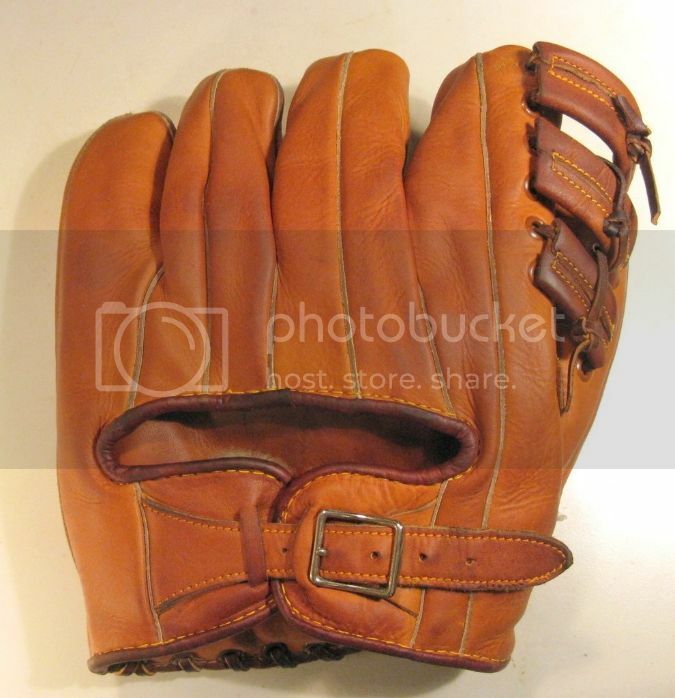 There was a tag attached to it that said, "Glove was purchased from Frank Hayes Apr '52". 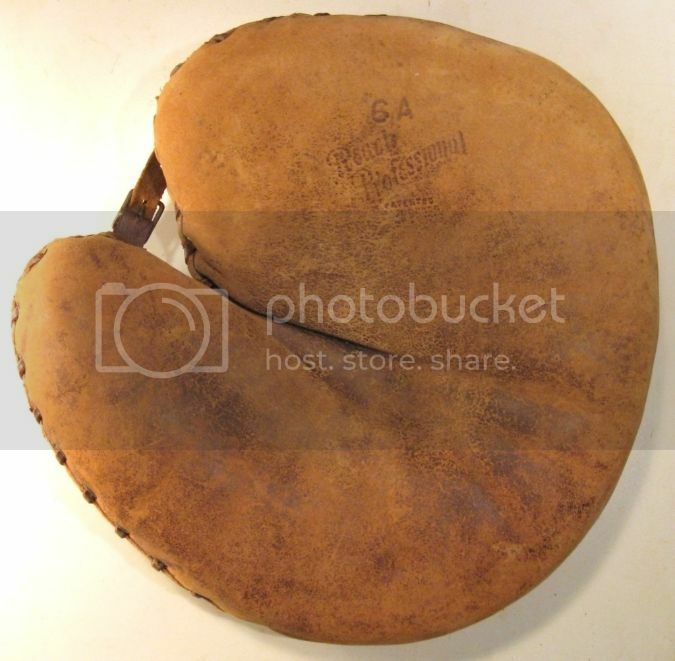 I think it's a swell mitt. Last edited by atabats on April 2nd, 2017, 5:59 pm, edited 1 time in total. 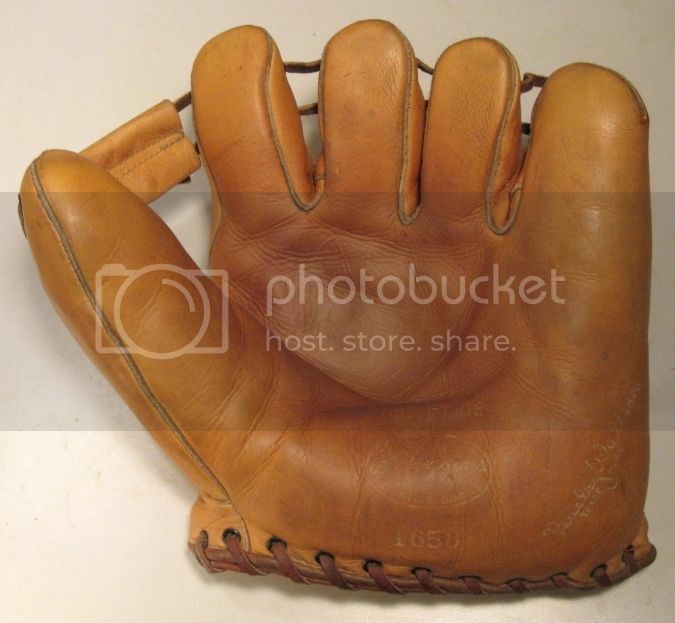 I recently picked up this 1920 Reach model 6A "Professional Model" catchers mitt. It's a unique one with the combination of the" Holdfast" wrist opening and the buckle web. It was made from Reaco golden horsehide. The leather is now soft and worn to a beautiful patina. It's a big boy at 11" diameter. Found this one over the weekend. It's a smaller mitt 9"x9", but it's the first crescent I've ever found at a flea market. Looks like it originally was a laced back but was converted to a buckle with some gnarly rivets. Once had a patch on the thumb as well. Been pretty slow with the weather around these parts. Anyone interested please make an offer at richb34@comcast.net.